We all know how weak product warranties may be. At least once in this life, everyone has been through buying a kettle and hearing strange sounds from it three weeks after. But what if it’s not just a kettle turning into a pumpkin (or, better to say, into a lemon)? What if this is a car that costs a whopping $33,000 or even more? ‘Lemon law’ is an umbrella term for all the claims when customers request compensation for their purchase going ‘sour’, or malfunctioning. Though they are not always about the cars, the term is most common on the auto market. The history of ‘lemon’ legislation in America started in 1970s. The consumers in the US had been filing complaint after complaint about the overuse of disclaimers in vehicle sales. In response to that claims, the government introduced the Magnuson-Moss Warranty Act to make the car market more customer-oriented. This law is still in action at the federal level. Later on, state authorities developed their own lemon-law measures. All lemon laws boil down to getting the money for a vehicle if it does not function up to the expectations. Sounds like a blessing, but in reality, this law is not always effective. Your chances to make use of it depend on substantial preparation and research. Basically, you should find the answers to several important questions. Which vehicles are applicable? How exactly does your one fail to function? Can you prove it? What expectations can you have, according to the law? These question lead us to a kind of philosophical thinking. Think of your future car as of a lemon car before you buy it. Apparently, it would also be good to keep lemon law in mind when using the car. Let us start with the existential question number one. You cannot get a refund for any car — otherwise, millions of used car owners would be stinking rich. The vehicle qualifies as lemon only when it has been purchased with a warranty. This document (or, more often, document bundle) can be given by an automaker and/or a dealer. The responsibility (including payments) is mostly on the car manufacturer. However, there may be the cases when dealers have to pay, too. the mileage should not exceed a certain mark (anywhere from 12,000 to 24,000 miles). Local law is more specific about what makes a car a lemon. Here are some more intricate details. Google them all for your state before initiating the lemon process. Type of vehicle. Most of the lemon laws don’t cover motorcycles, motor homes, and off-road vehicles. Extent of damage. Learn which problems are considered substantial and which are not. If you don’t like the sound or the look of some details but they don’t impair daily use of the car, you are unlikely to get any refund. Burden of proof. You should be able to demonstrate your point. That is, be ready to present expert evidence or compare the prices before and after the purchase. Lemon law acts are very specific about such things as difference in prices (e.g., 10%) or the time that may pass after your warranty expiration (e.g., 6 months). Previous uses. 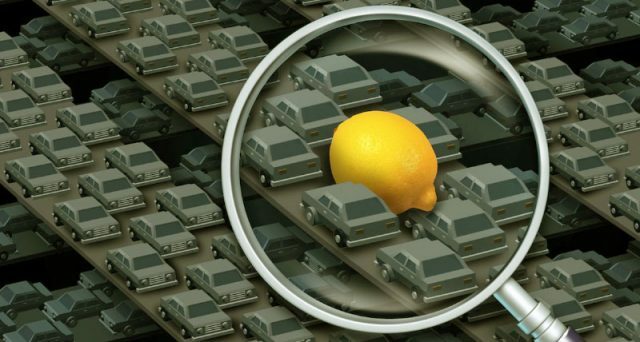 Lemon law for used cars differs from state to state. Some states have lemon law against deceptive sales practices even when a car is warranty-free; others are not so friendly to the customers. If you bought car in one state and then use it in another one, compare their local lemon laws and choose the one that looks more favorable. Auto details. Study your contract with a dealer: some contracts are very specific about the details that are and are not to be fixed. Keep record of all the repairs and negotiations with the dealers. If they refuse to document what happened, there are ways to document their refusal. Such things as warranty repair orders or repair invoices are key to argumentation in court, especially when you file the complaint after the warranty period. Notify the dealers once any problem occurs. While doing this, make sure that your description of the problem remains the same for each of the repair attempts. Email the manufacturers. There may be special requirements about the period when you can address them with lemon issues. When it comes to the court, paperwork may be not enough. Have an expert mechanic and an attorney by your side to oppose the auto makers’ expertise. The saddest thing in this all is that you are likely to be without the defective car during all the repair and trial period (which can extend far over a year). With all the expert help needed, this is going to be a serious investment. As you can see, the earlier you think about a car as a lemon, the more problems you manage to prevent. Why don’t we try to prevent them before the purchase? The best thing to do is to avoid the sour scenario altogether is getting a vehicle history report before you buy anything. Try to detect as many issues as possible. Do a VIN history check, inspect any used car with your trusted mechanic, and don’t forget about the warranty. The check will instantly demonstrate many problems with the mileage, flood, hail, or fire damage, and manufacturer recalls. Remember that used car market is full of lemons, and many tools for the consumers have been developed to stay away from them.